Felix III is from first owner and little used with only 200 engine hours. Powered by twin 210 hp Mercruiser Cummings turbo diesels. With it's Italian design it really pops out. The boat has a modern design and is built with high quality materials. There is room for 4 people. 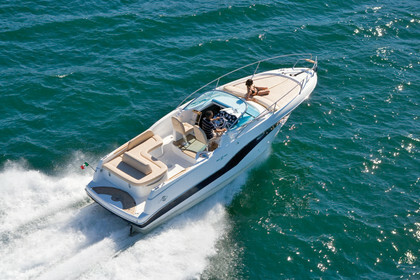 This boat is ideal for fun family trips or fishing. It has always had good maintenance and stayed in winterstorage. Fully loaded and ready for its new owner. If you are looking for a boat with cabine but also a sport feeling this is the boat to go. Contact me if you want to visit the boat.